Jeannette Eats Spaghetti : Mosaic this. Garden that. 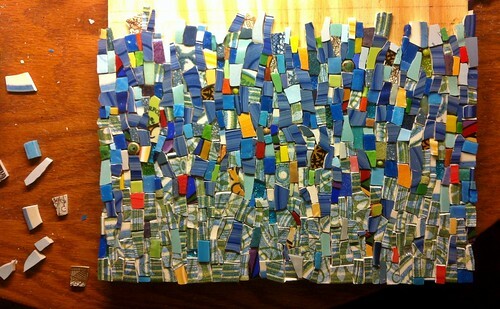 I started a mosaic over the weekend. You see, I made a promise with myself back when I finished the Scheufele mosaic that I had to stop all things mosaic until I found a new career in a new town, but omg dude, that is never going to happen. Unsuccessful job searching is tiring, depressing and an unproductive way to spend my time. I prefer to grow more food this year. I want to have an ever bigger garden and can, dry and freeze the foods that I grow. I want to become more self-sufficient in that way. 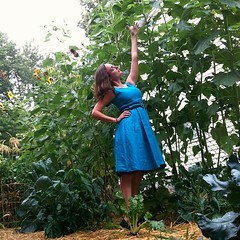 Since I decided to garden bigger this year, I don't need to job search so much right now. Which means I can work on a mosaic. I realized the job search thing on Thursday, let it sink in on Friday, then started a mosaic on Saturday. I've felt confused about a lot of things for a while now so I decided to just start gluing pieces from one end to the other of a piece of wood, one foot by three feet. It feels nice to not plan ahead much.